This blog is no stranger to the books to TV and movies adaptions with the Alice Through the Looking Glass film being previewed on this site. And whilst the Alice franchise may offer an overflowing supply of whimsical psychedelic weirdness, if you're looking to visit a more visceral fantasy world, then the hit TV series Game of Thrones should provide us all with more than enough swords, castles and chaos. I first saw the TV show a couple of years ago and was gradually sucked into its richly complex storyline, enjoyably pompous characters, and the appealing use of strong female characters that gave it the edge over most other fantasy offerings. The show has since become a huge global hit and is now the subject of computer games, elaborate merchandise and even betting sites. But what really made the television series so compelling was the weaving of political intrigues that led me to check out the series creator George R. R. Martin's original books – A Song of Ice and Fire. There are so far five books in the series, with a sixth apparently being painstakingly written at the moment. Whilst they may not offer quite as much visceral power as the excellently-acted TV shows, the books offer an unparalleled glimpse into the minds of the lead characters. You can really get to grips with the many layers of intrigue behind this darkly-constructed fantasy world in the books, and each chapter's powerful use of cliffhangers made the novels very hard to put down. But there's an interesting development in that the TV shows have just about caught the books up, and already there have been a few spoilers that have affected many a fan's enjoyment of the original fiction. I'm sure I'm not the only one who's tried to avoid any external sources affecting my reading, as sites like Betway have cleverly added to the thrill of the story by asking fans 'What do you think to these odds on who'll be killed off next?' and such questions form a big part of the enjoyment of these fantasy novels. The fact that betting sites now feature odds on the fate of characters in the fantasy series alongside sports betting options and even the outcomes of presidential elections signifies just how powerful this series is as a cultural institution. 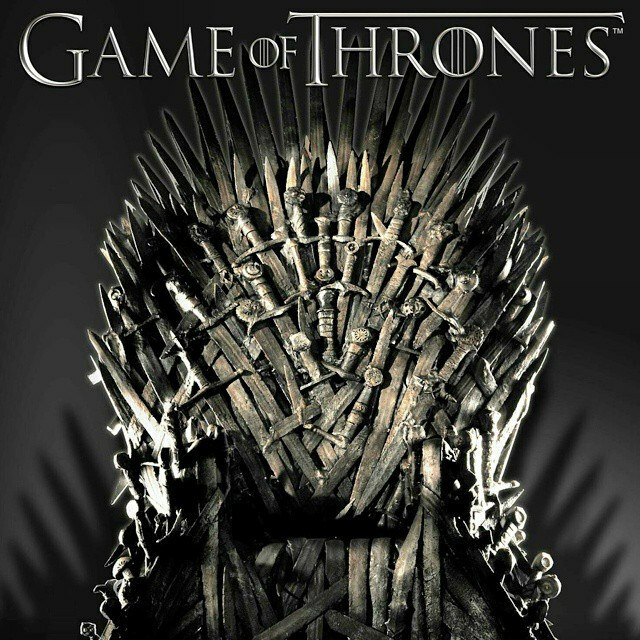 Although many have stated that the novels offer a somewhat two-dimensional approach to characterisation, the forces of good and evil in the novels never become too clearly defined and that's why Game of Thrones is clearly the one to beat in the booming fantasy world. 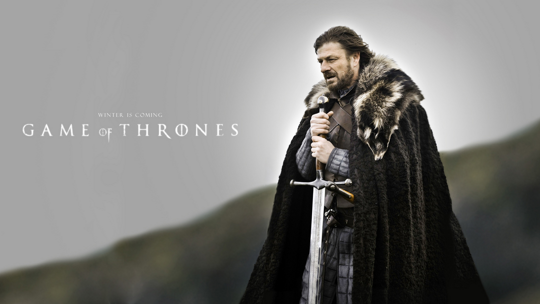 I actually have seen Games of Thrones yet , but I know it's a very popular on TV. I hope you enjoy your books Kim! I seen the TV show love it I had not read the books I bet it has more that the show did not express. Have a great weekend. GoT= awesome! Have you seen the latest teaser poster?!?! Aaaaaaaaaah! Can't wait for the new season. And also for the latest book. Feels like we've all been waiting forever for it! I've never been much of a fantasy reader, so Game of Thrones is something I'm totally unfamiliar with, both in books and on TV. I know lots of people love the series, and I may get to reading it eventually... But when it comes to stories, I tend to prefer more modern and/or realistic ones. I love seeing all of your books marked up, though, Kim - that's the sign of a truly attentive reader! 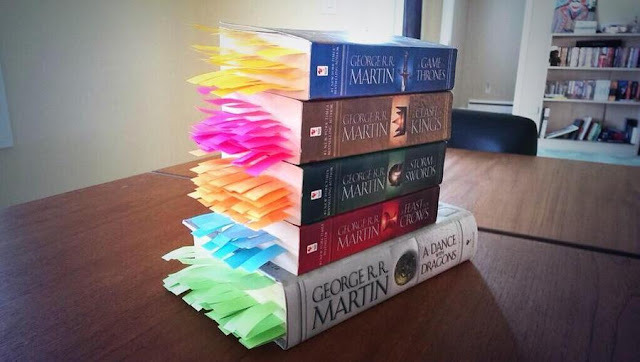 I haven't seen the show yet but have been thinking about reading the books. It's got all the things that I'd like :) Have a good weekend, Kim! You already know I'm a huge fan of Game of Thrones! I've read the first book- they are almost too long and detailed for me to read. But since I've watched all of the tv seasons, it makes the books easier to read for me. I'm so curious as to how the next season and book will play out since they show will probably be released before the book! I'm glad you enjoy these Kim, I love having reading buddies I can talk to about books! I really need to start watching the show again but the all the twisted plots get to me and I'm one of those annoying people that get so invested in a show and when my favourite character die or turn evil, I stop watching. Maybe I'll pick up the book instead? Glad to see you back posting, Kim! I honestly miss you! I'm a huge Game of Thrones fan, and I am also excited about the new content to be released, as it was one of my favourite series. I had to catch up, as I was quite busy with work to finish the past season. Lovely to see this type of post on your blog. Happy weekend. great post. I am also a big fan of Game of thrones. Sounds like you've really enjoyed the book series Kim! My husband is a fan of the show and I've watched it a little peripherally when he's had it on but I never really got into it. Maybe I would find the books more compelling. We LOVE Game of Thrones! I haven't read the books. Maybe someday after the series has ended I will read them all. Hopefully Mr. Martin will keep on writing! I like watching the Game of Thrones too. I hope Lord Snow will come back. The killing scenes are so violent. You are so organized with your books. I'm impressed. I actually haven't watched it but since it's so popular I was interested to know if the books are good too. I've never watch this show, too much gore for me, Kim. I love Games of thrones - even though it is violent and gory - but the story line works with my sense of adventure and fairytale worlds :) Thanks for sharing this Kim, hope you are well and enjoying the run up to christmas :). Betting? Wow!! I'm king of late, I need to do some serious binge watching . I heard so much about this show.. I have heard so many spoilers from friends watching the show, there is no reason to watch it! I love books better though! If I ever want to to know more I will probably read the books! I would love to read the books more than watching the series. I'm a fan and the books are great The 3rd or 3th one lags a little but picks up later. Have fun reading! I know I'm late to the post but just have to say I am on book 2 and have started to listen to it instead of reading (not the same - just saying!) but I am thinking of separating them - LOVE the post it stubs, I did this with Anna Karenina and made a book mark with all the characters names on which sounds über geeky but really helped! I think sectioning it off not only gives a small punch of achievement if you reach the next section but makes things roll quicker - maybe it's just me!